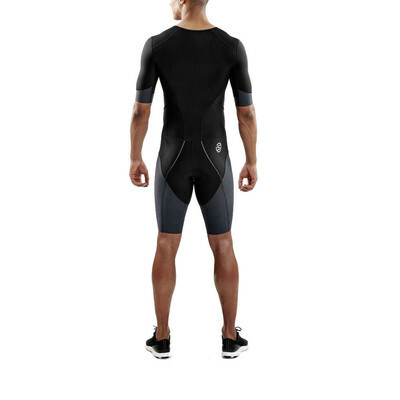 Whether you are in the water, on the saddle, or on foot, the Skins DNAmic Triathlon Short Sleeve Compression Skinsuit helps you transition between stages with ease and smash your PBs. 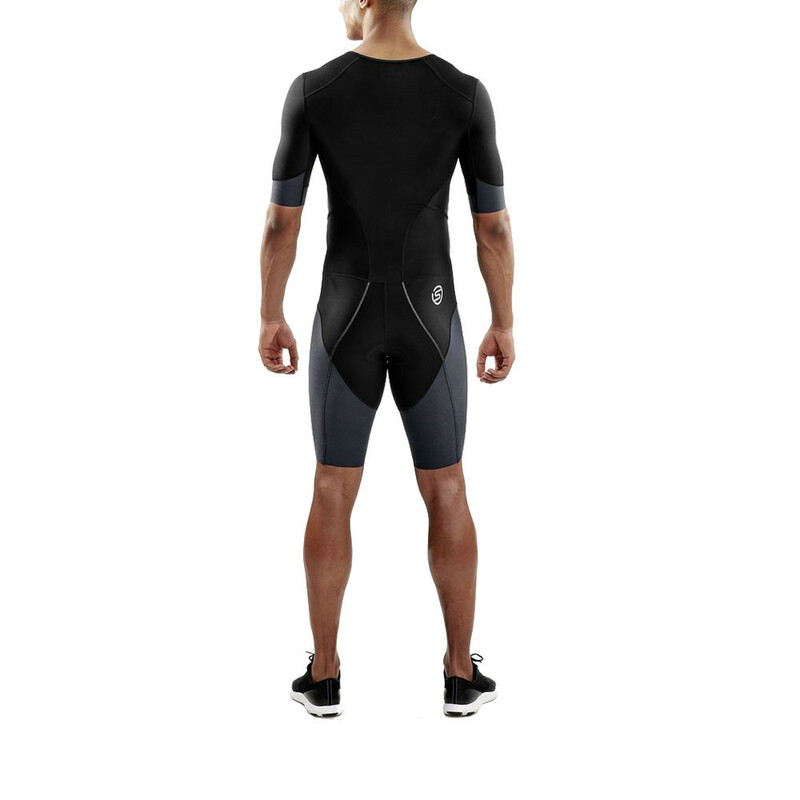 "Does exactly what I want it for"
The Skins DNAmic Triathlon Compression Skinsuit combines Skins most advanced compression technology with functional features to help you transition and succeed with ease. The compression technology used in this skinsuit increases muscle oxygenation, stabilizes active muscles and reduces blood lactate build up. All these benefits combined allow a great enhancement of your performance and help to speed up recovery time from all exertion. When completing a triathlon it is important to be comfortable and secure in the clothing you are in; any unwanted distractions can slow you down. 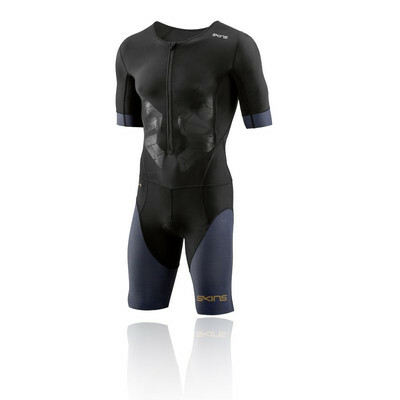 This skinsuit has a number of features designed specifically for triathlons that can increase your performance levels and give you an advantage over the rest. The suit is made from strategic slimy fabrics that reduce drag while you are swimming. An elastic Interface Triathlon Chamois guarantees a comfortable time riding your bike, and a wide gripper tape with no inner leg seams reduce friction during your run. These features have combined together to create an elite-level skinsuit that is guaranteed to leave you performing, and feeling, better than ever. The suit is also fitted with biomechanically positioned panels and seams. These work towards supporting and stabilising the muscles, reducing both fatigue and the risk of injury. These innovative designs come together in a sleek and stylish look that only Skins can create. This means that not only will you perform better than ever before, but you'll look good while doing so. The fabrics that are used in this Skinsuit are state-of-the-art and have numerous benefits to both build quality, and your overall performance. The main body of this suit is made with Memory MX Fabric, which has a superior high-stretch yarn that doesn't change shape or sag, so you can maintain consistent compression throughout countless workouts. The A400 long tights have 70D Memory MX over the knee and Achilles tendon to provide unrestricted natural movement. Finally, 210D Memory MX over the ITB and TFL muscle groups help reduce the risk of injury. Skins compression fabric is made with a warp knitted mix of yarns that give you a carefully calculated level of stretch that allows for controlled compression and durability. These fabrics, and their qualities, all combine to result in unrivaled compression, performance, and satisfaction. Dynamic Gradient Compression - Increases oxygen flow to muscles, reduces blood lactate. Strategic Slimy Fabrics - Reduces drag during swimming. Elastic Interface Triathlon Chamois - Increases comfort on the saddle. Wide Gripper Tape - Reduces friction during your run. 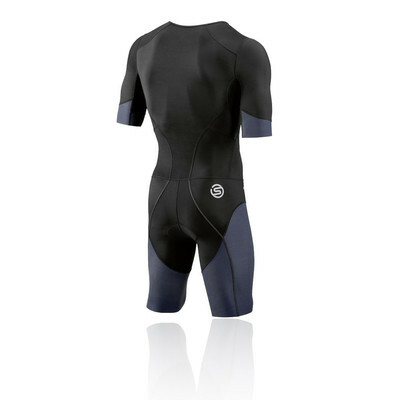 Bio-mechanically Positioned Panels and Seams - Supports and stabilises muscles. Fabric Technology - Consistently stays in shape, compresses muscles.